Back in 1996, a few things happened in my life. I got married, and my former company released a few games that were fairly notable. The more notable game was “Duke Nukem 3D“, a landmark in PC gaming history. 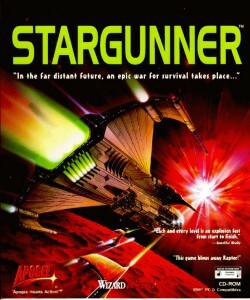 The other game that didn’t get as much attention was Stargunner. 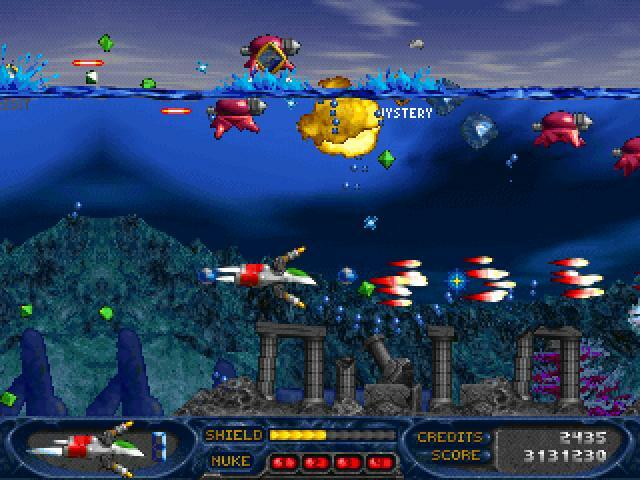 Stargunner was notable for it being the final game released under the “Apogee Software” game label – after that, everything from my former company was under the name “3D Realms”. So the final game for my company’s old name held some attraction to me. I liked Stargunner a lot, because it was a shooter game – the kind of game that my company had released a few times in the past before that (those being Major Stryker & Raptor). Wanted to say a few words about Stargunner here. First off, at this point, Apogee/3DR’s in house musician (Lee Jackson) was well entrenched at this point, having worked and done the music on numerous projects in the past (some of which were the aforementioned Duke3D, as well as Rise of the Triad & Shadow Warrior). This of course brings us to Stargunner, a game that had all if it’s music done by Lee Jackson. Back in this time, Lee and several other folks making game music were either influenced by, or had their feet firmly planted in the mod scene from back then. Another company of which I have known for ages, Remedy Software (Max Payne, Alan Wake, Death Rally) got their start out of software and projects done for the mod scene in the early 90’s. To that, all of the music in Stargunner was done in this format. 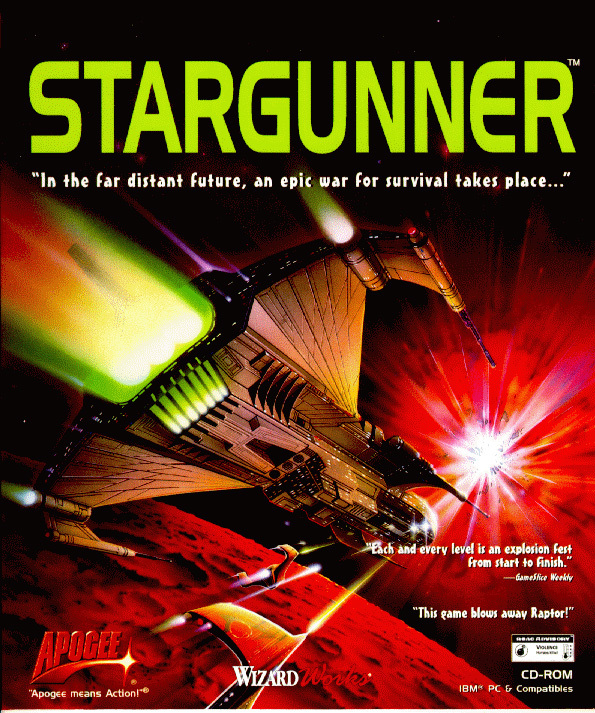 Stargunner was released on November 19, 1996 and was discontinued some years later, and eventually released as freeware (by me at Apogee/3DR) on June 22, 2005. You can still download the game here. It’s DOS, but it works in DOSBox just fine. Anyway, as part of the freeware release, we also released the soundtrack to the game. Stargunner was one of those games where the soundtrack was on the CD, and you could listen to it through the game that way. Given the way game music was back then, this made for a vastly improved listening experience when playing the game. We took those tracks, stuck ’em on MP3, and it was released. That too is still available, check out the same download link. This game was also interesting, as the “Apogee Fanfare“, which had been in a boatload of games to that point, was given a rather large sonic upgrade. And it was never used again, as this was the last “Apogee” game. The updated/mod version is in the Stargunner Soundtrack download. A little past history of Stargunner. Back when the game was first pitched to Apogee, the first two betas were submitted from the developer, and they had well, one of the most uh, “interesting” theme songs I’d ever heard. The developer submitted it with a song with lyrics. That in and of itself wasn’t so bad, but the actual singing in the soundtrack. It was well.. NOT GOOD. They also had seriously obfuscated the location of the singing in the game’s data file – I tried some years later to release just that, but the original developer couldn’t find their file, and while I still had a beta from way back then, I still couldn’t extract it out. Anyway, they made a change in the second beta where the signing was different, but it was still pretty bad. The singing disappeared after that. Typical musician – never liking their own work. I thought it was hilarious then, and even when I break it out now, I still end up playing it a few times in a row, so I still find the humour in it 16 years later. The original article was published on October 29, 2012 – What follows is a new update. Stargunner is almost 20 years old now. It’s been released as freeware for some time now, and really, there’s nothing new going on with it. So it’s quite interesting to me that there’s an update to this article – and a new one. The one thing that always bugged me over the years was my inability to access those original Stargunner betas with their singing. I tried a few times over the years to get into the files to get the mod files, but failed. I’m not a programmer, so my skill set there is limited. So fast forward to June of 2015, and I was talking with Evan Ramos, one of the EDuke32 programmers about this. I sent him the betas that we have, and he was successful at getting into the files, and broke the betas down into all their component pieces. Here’s what Evan said about how he got into the encrypted game files..
Stargunner stores all its game data, including art, sounds, and music in a container file named STARGUN.DLT, similar to an IWAD in a Doom engine game, but with a specific encryption that only the game itself knew how to unpack. Fortunately, I didn’t need to reverse engineer any of it myself, but I did piece together a complete DLT extracting tool from the work of a few different people who figured out how to list all the files inside the DLT and decrypt them. The full technical explanation could be a post of its own, but I’ll end with credit where credit is due: “Wormbo” on the XeNTaX forums, Ville Vuorinen (“xtaateli”), Igor Gutnik (“The_coder”), and Adam Nielsen (“Malvineous”). Awesome! Thanks for the information! Really liked your blog-entry! Wow! Thanks for your update. :-) Playing it all the years. This game and it’s music define my childhood. Thanks to whoever worked on this project.